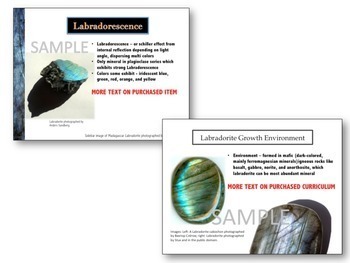 Labradorite, a remarkable rainbow shimmering stone exhibits a property called labradorescence. 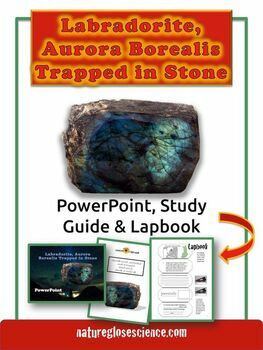 Labradorescence, or the schiller effect, comes from the stone's internal reflection depending on the light's angle falling into the stone, which disperses the light into multi colors. 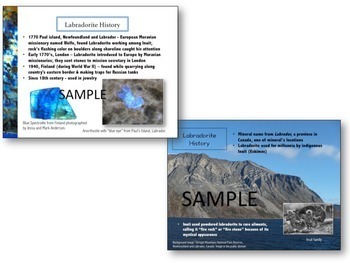 It's the only mineral in the plagioclase (feldspars consisting of aluminosilicates of sodium and/or calciummineral series) which exhibits strong labradorescence. 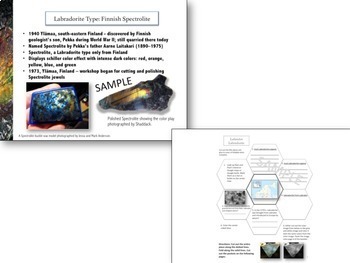 Labradorite's histroical and geographic connections are studied in this unit including Labradorite's discovery and legend from Newfoundland and Labrador and discovery of spectrolite in Finland. Students are given two maps of the countries as template cutouts which can be optionally used for a labbook or interactive journal page.